NASA and 11 other international space agencies released a plan for joint cooperation in space exploration Aug. 20, 2013, called the "Global Exploration Roadmap." When it comes to human missions to an asteroid and Mars, NASA can't go it alone, the agency's chief Charles Bolden said today (Aug. 20). NASA and 11 other international space agencies committed to cooperating on deep space exploration together in the future in a plan released this morning. 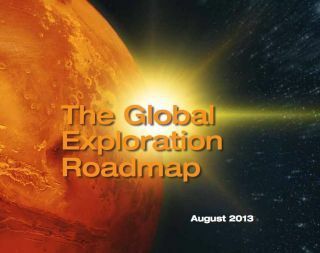 The "Global Exploration Roadmap" is an update to a plan first put forward in 2011 that unites the interests of the space agencies of Italy, France, Canada, Germany, India, Japan, the Republic of Korea, Ukraine, Russia, the United Kingdom, as well as the European Space Agency and NASA. Under the plan, the international group aims to work together to mount robotic and human missions to the moon, nearby asteroids, and to Mars. The roadmap also emphasizes the importance of continuing operation of the International Space Station for research into fundamental science, as well as for testing technologies and strategies to be used on deep space missions. The joint space agencies, which make up the International Space Exploration Coordination Group (ISECG), outlined their common goals in space exploration, including using space activities to probe the question of whether life exists beyond Earth in the universe. "The search for life is a central goal of space exploration," the ISECG officials wrote in the roadmap. "Pursuing this goal continues the cultural quest of humankind to determine whether we are alone in the universe, and answers deeply rooted questions about our origin and evolution." NASA also plans to build on its long experience of moon exploration to help other countries and commercial companies launch robotic missions to the moon. "These missions could demonstrate critical capabilities for future Mars missions while meeting other lunar exploration objectives, while we at NASA, we focus on deep space exploration to meeting the President’s challenges of sending humans to an asteroid and on to Mars," Bolden said. The roadmap outlines upcoming NASA missions that offer opportunities for international cooperation, such as NASA's plan to lasso an asteroid using a robotic spacecraft and drag it in toward the moon's orbit so that astronauts can visit it. "The roadmap demonstrates the important role of NASA's asteroid mission in advancing the capabilities needed for exploring Mars and the economic and societal value such exploration can bring about," Bolden said. The international space agencies also aim to work together to better understand the risks of weightlessness to the human body, and how to mitigate the negative health effects of space exploration on astronauts. "This is essential for human exploration and will enable a human presence across the solar system," the roadmap states. "Pursuing this goal also yields innovation for Earth-based health care."